The customer visits your online store, finds the product he is interested in, places it in a shopping bag, then introduces the necessary delivery information, card details and passes on to the order payment link. The customer is redirected by your online store to the CPSBill payment system. The customer must enter his personal data related to the payment procedure (bank card data). After clicking on the "Checkout" button, the data related to the procedure of payment is sent to the CPSBill platform. CPSBill begins the payment processing. It checks the payment with Fraud-monitoring system. 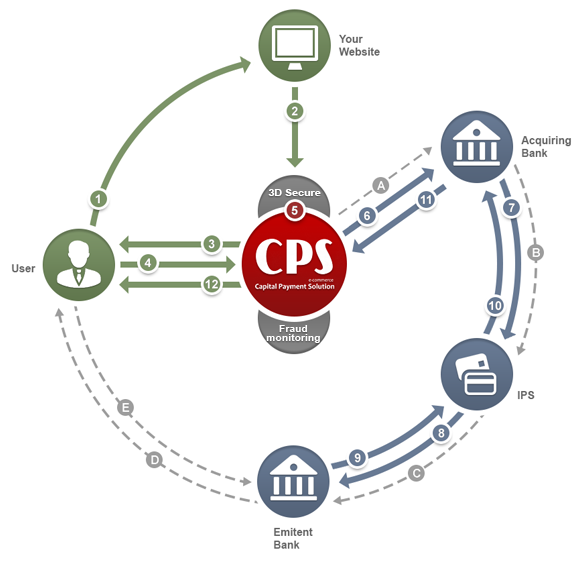 CPSBill Platform sends to acquiring bank a request for payment. Bank identifies the card, checking if it participates in the 3D Secure program (steps A, B, C). If the customer's bank card does participate, the service redirects the customer for an additional verification on a secure page of the website of the bank that issued the payment card (step D, E). If the 3DSecure verification is passed, the acquiring bank forwards the request to the payment system (Visa / MasterCard) to withdraw funds from the customer's bank card. The payment system (Visa / MasterCard) forwards the request to withdraw funds to the issuing Bank (The bank that issued the customer's payment card). The issuing Bank checks if there are sufficient funds and withdraws them from the customer's card balance, informing the payment system (Visa / MasterCard) about this action. The payment system confirms the transaction completion. The Bank notifies the CPSBill platform that the transaction is successfully completed. CPSBill lets the customer know that the money for products or services have been debited from his card. The customer is redirected to the secure page of the website of the card issuing bank for additional verification. The customer sends the requested confidential data, thus confirming that he is the owner of the credit card. 12CPSBill lets the customer know that the money for products or services have been debited from his card..